It is easy and comforting to get swayed by the rags-to-riches fable constructed with such contemporary diligence and zeal by first-time director Advait Chandan. But once you get to penetrate the bubble of bonhomie and get into thick of things, so to speak, you come face-to-face with an unnerving sterility. Secret Superstar is one of those well-meaning films that keeps reminding you constantly of how well-meaning it is. Many times as I watched Advait Chandan’s panoply of tricks and treats I felt I was being offered a Christmas deal with ‘Santa’ Aamir Khan mentoring the film’s 15-year old wanna-shine Zaira Wasim whose brilliance as an actor is far more dazzling than anything that is written into this film to support her dreams. Everyone, we are told in many different ways in this stretched-out ode to wish-fulfilment, has the right to dream. Insia (Wasim) wants to be a musician, a fact that is rudely and ruthlessly repudiated by her rough and impatient Daddy, played by a remarkably self-assertive actor named Raj Arjun. Predictably and conveniently Daddy is a despot, much in the same way as Ishaan’s daddy in Taare Zameen Par…Oh, didn’t I tell you? 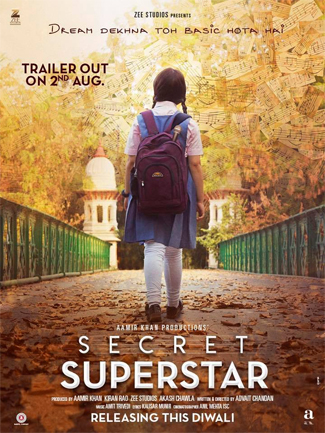 Secret Superstar is a not-so-secret carryover from the other far more moving and rousing drama where a dyslexic kid was pulled out of his crushing plight by his art teacher. Aamir Khan’s saviour streak triumphed again. A lot of people thought the climax of Taare Zameen Par was way too Utopian to be a convincing antidote to the dystopian condition of the little protagonist’s life. In Secret Superstar the theme of wish-fulfilment is played out at a much louder octave, almost like a flag being waved at us from the pulpit of righteousness that screams at us with messages of the empowerment of the girl child. This is the world Charles Dickens’ Oliver Twist transposed into a state of magnified melodrama where the orphan will ask for more porridge even if the man providing the food is a tyrant. Yes, we get it. But do we have to keep getting it for 150 minutes? You will find more subtlety in the girl-power plugs and Beti Bachao endorsements on Doordarshan than in this film. Secret Superstar favours a pulpit propagandist tone of narration that kills most of the tenderness that the theme secretes in its initial stages. We know the girl is a hero. We know she will conquer her father’s bullying tactics because she has a strong-willed mother (played with t shirt-top messaging bravura by Meher Vij), a supportive friend (Tirth Sharma, giving the film’s most endearing performance) and most of all, Insia ke paas Shakti hai…No, not just nari-Shakti but Shakti Kumar,a loud obnoxious embarrassment of a music composer who mentors Insia to stardom. From the time Aamir Khan swaggers into the plot as Shakti Kumar, the film begins to fall apart. The narrative crumbles under the burden of the character’s inflated flamboyance. Unable to bear the weight of its egoistic character Aamir’s performance is more a homage to Shakti Kapoor and his ‘Aaa-ooo’ brand of self-assertion than Anu Malik or Nadeem Saifi (the two composers he seems to have copied). Shakti Kumar is a product of a superstar’s vainglorious yearning to stutter his skills. It’s a character written in italics, mostly exclamation marks, in the same league as Hrithik Roshan’s hammy turn in Sooraj Barjatya’s Main Prem Ki Deewani Hoon, but rescued here by his proclivity to sniff out a good deed. Secret Superstar is suffused in spasms of nobility, piloted by its idealism and finally transported to a self-congratulatory finishing line by a central character who is everything that a brand ambassador for female empowerment should be. Cleverly the film steers away from religious references and restrictions, although the burkha plays a big hand in the protagonist’s journey from oppression to creative liberation. It was easier for Aamir Khan to take religious digs at holy cows in PK where the target was a pacifist majority. Now of course the rules have changed. If you want to be satirical and censorious at the cost of religious oppression then you must be prepared for a backlash. The gau rakshaks are watching the holy cows. Secret Superstar simply opts to be cute about its veiled references and succeeds in conveying an engaging though self-limiting saga of smothering the smothered protagonist’s radicalized state of being. No wonder this film was originally titled ‘Aaj Phir Jeene Ki Tamannah Hai’. This is Waheeda Rehman’s clarion call for emancipation from Vijay Anand’s Guide given a patriarchal payoff by a loud and boorish mentor and guide who wants to be labeled a liberal feminist. Secret Superstar is a heartwarming portrayal of girl power. A bit of restrain and some muted melodrama would have taken this film much further. It has long sturdy legs. But chooses not to go far enough.